Blast trauma can be similar, depending on how the shock waves reach the animal. Acoustic trauma, such as sonar, is not well defined in the world of pathology, he said, but it is different from blunt force and blast trauma. Joe and most of the other scientists involved with the study of L-112 are withholding judgment until all the information is in. Whatever the cause, he said, the young orca did not swim very far before she died. Ken Balcomb, director of the Center for Whale Research, has a long history with unusual deaths of marine mammals going back to 2002, when the Navy apparently killed 16 whales during an exercise involving sonar in the Bahamas. The Navy acknowledged its responsibility two years later. See the Kitsap Sun report of Jan. 1, 2002. In that incident, Ken was instrumental in saving the heads of some animals for forensic examination, without which the mystery may have gone unsolved. When I talked to Ken yesterday, he said the injuries sustained by L-112 were similar to what he has seen before. He mentioned a Cuvier’s beaked whale found near Seaside, Ore., in 2002; a killer whale, L-60, found about a month later at Long Beach; and a Berardius (Baird’s beaked whale) at Lapush in 2003. L-112, laid out and prepared for necropsy. Balcomb has zeroed in on live aerial bombing practices conducted off the West Coast. According to a permit issued under the Marine Mammal Protection Act (PDF 690 kb), the Navy is allowed to conduct an average of 30 bombing exercises each year. That includes the use of 500-pound Mark-82 aerial bombs — although the Navy says the actual number of exercises does not come near that number. “What we may have experienced over these years is an unusual mortality related to these bombing events,” Ken said. Last night, I contacted the Navy’s John Mosher, Northwest program manager for the U.S. Pacific Fleet. There were no bombing exercises in the Long Beach vicinity for at least 30 days before L-112 was found, he said. I addressed the possibility of a sonar injury in Water Ways on Feb. 18. Ken, a former Navy technician, is suspicious of Navy statements because of his experience in the Bahamas, where the Navy eventually admitted to using sonar in a planned exercise. As he tells it, his requests for information kept being directed to other Navy exercises. It took a month before he could get confirmation of the exercise in question, he said, and that’s when the Navy decided it was time to quit denying the indisputable evidence. To examine past bombing practices, Ken and I both called up the first “Annual Range Complex Exercise Report” (PDF 121 kb) covering the period from Nov. 12, 2010, to May 1, 2011. Lynne Barre, a marine mammal specialist with the National Marine Fisheries Service, said her agency has staff experts in Washington, D.C., who are qualified to review classified documents. They looked at the numbers and concluded that the training exercises during that period met the requirements of the permit, and they issued a new one. If we are to discount connections between Navy bombing and the death of L-112, it would be reassuring to know exactly when such activities took place, Balcomb says. But not even Lynne Barre, a leading marine biologist with the federal government, is trusted with that information. Lynne told me she may need to seek help from her headquarters office to work on possible correlations between Navy activities and the mortality of marine mammals on the West Coast, including L-112 and possibly other dead whales going back for years. My inquiry a month ago about any exercises involving explosions during the time in question remains unanswered by the Canadian Navy. Balcomb is asking the law-enforcement arm of the National Marine Fisheries Service to conduct an investigation into the deaths of the whales and to involve the Department of Justice, if necessary. L pod, the largest of the three Salish Sea orca pods, has been the one with the greatest number of individuals who have mysteriously disappeared. In 2008, during the annual return of the killer whales to the San Juan Islands, a shocking seven orcas came up missing — including five from L pod. See Kitsap Sun, Oct. 23, 2008. Did something kill them all at once? We may never know. But I can’t avoid an uneasy feeling about L-112, who would normally be traveling with her closest relatives, including her mother, brother and aunt. 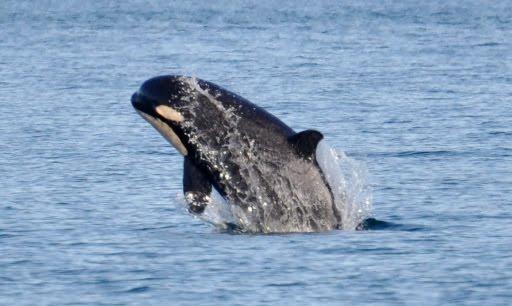 Let’s hope that whatever killed L-112 left her relatives alone, and we’ll see them swimming into Puget Sound with the rest of L pod in May or June. We need to ask our elected senators and congress members to investigate this matter. Wow, that sure is a whole lot of speculation there. What about more likely possibility of collision with a larger commercial surface ship? Out of the cases referenced, how many were conclusively proven to be a result of a bomb? Where is this unusual mortality? In nearly 10 years there have been (according to the information here) three deaths that “may” be a result of bombing. Rooster, it is important to remember that this “researcher” loves orcas more than human beings. They are the only reason he has for living. 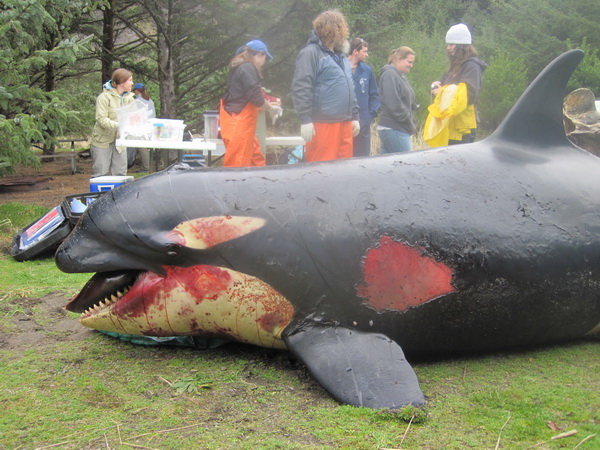 If 3 orcas died of “unnatural” causes in the history of the species, that is 3 too many. He doesn’t care about our country or its defense. He doesn’t care about you or me, he only cares for those who blindly, religiously worship orcas. I envision a day when Mr. Balcomb in held in the jaws of a KILLER WHALE, being shake like a harbor seal or some other tasty morsel. If interviewed by Chris Dunagan about this tragic event, I would speculate that the cause of his death was the fact that he was merely food to the beast and that we would applaud the murderous whale’s decision. You just assumed a whole lot there, I’m beginning to think that you only care about the defense of this country. Not me or rooster or yourself. I can only imagine what they’ll say about you when you have a 500lb bomb dropped on you. Anyways what I’m really saying is life is important, mine, yours, animals, fish, Muslims, turtles whatever. Don’t mock life fool. We are following the issues with the Navy from here in Cannon Beach, Oregon. Monday night we will be going to their meeting in Tillamook, an out of the way location they picked for their meeting. NOAA and specifically Jim Lecky are giving the Navy what they want, when they want, which is more area, and the supposed incidental taking of cetaceans. Ken Balcomb please contact us. We want to know what we can do the help! Are these the same experts that said the killer whales in Dyes Inlet several years ago were trapped there by the noise made by cars on the Bremerton bridges? They wanted the stop traffic until the whales could escape. Are these the same experts who also thought the killer whales in lower Hood Canal were there much too long and might be afraid of or trapped by the Hood Canal floating bridge? Or are these experts “experter” than those experts? Wouldn’t it be amazing if the military’s mission was about preserving life and liberty for “all” instead of murdering innocent victims? Possibly the mammal died from injuries caused by a bomb. One has to wonder whether Mr. Balcomb’s intent is merely to push his biased agenda or to truly find out the cause of this whale’s death. To truly find out the scientifically justifiable cause of this whale’s death, you need to be open to all possible causes and rule out particular causes in a logical manner that is not pressured by hysteria or influenced by emotion. On February 4, 2012 there was earthquake activity off Vancouver Island and off the Oregon Coast. Then again, there were 2 earthquakes off the Oregon Coast on February 7, 2012. Isn’t it plausible that any one or the combination of these earthquakes caused disturbance to the whales more so than a Navy bomb, especially when the Navy rep said they weren’t doing anything at that time? There are peer-reviewed scientific studies that underwater earthquakes create noise levels and generate T-phases which are similar to man-made explosions. See Nishimura and Clark, “Underwater earthquakes noise levels and its possible effect on marine mammals”, J. Acoustic, Soc. Am. Vol. 94 (1993); Gallo-Reynoso, et. al, “Reaction of Fin Whales Balaenoptera Physalus to an Earthquake”, Bioacoustics, Vol. 20, (2011). Mr. Balcomb has indicated many inconsistencies in his accusations. First, on March 14, 2012 (Islands Weekly.com), Mr. Balcomb argues that the trauma evident to L112 is similar to that shown during a sonar event in the Bahamas. And he sensationalizes that the trauma from sonar “blew up” the head of the whales. This demonstrates his lack of knowledge because sonar is not by definition an implusive sound source like an explosion. Acoustically, those two sound signatures are completely different. See Southhall, (2007) for explanation that sonar lacks the same characteristics as seismic activity, an airgun, explosions, or impact pile-driving. Now to Mr. Dunagan, he has changed his tune to say that a bomb must have caused this injury to L112 comparing it still as trauma similar to that evidenced from the Bahamas incident. An incident in which there was no explosives used. For 30 years, people of the pacific northwest have refused to tag these Orcas in order to understand vital life patterns. If we had this data, we would have better idea of where this L112 was prior to the stranding and where its family currently is. And this rampant speculation could cease. Mr. Balcomb needs to do thorough research before pointing fingers and making accusations with little evidence. The facts presented here need to be looked at too. Stone, did you miss the part about Dr. Balcomb having served in the US Navy? It’s a ridiculous statement that a scientist who is a specialist in a certain research subject does not care about anything else. He doesn’t *worship* orcas; he studies them. Scientists tend to be passionate about what they do–it’s considered a good thing. There are fewer than 100 individuals of this endangered population remaining–that’s a serious cause for concern in terms of maintaining a viable population. So yes, the death of even a single whale, especially a female, is of concern to a researcher who specializes in the study of this species. There is also reason for concern because they are one of the most highly intelligent animals on the planet. But I guess you don’t care about scientific research. There are hundreds of thousands of troops defending the country, but very few experts on killer whales. Who are you to judge what people care about? And if you don’t care about killer whales, why disparage a person who studies them? It’s just completely idiotic. What are you doing to defend our country today? I am shocked by so little support for a man who I have come to respect greatly. As the article states he requested information on the training activities but it was “classified”. He is one of the only cetacean scientists in the U.S. who is is unbiased and has no conflict of interests with government agencies. We have such a great need for a board of cetacean scientists who have no independent or government interests to over see all Naval training activities, oil and gas exploration, in addition to air guns used to map the ocean floors. Great news that all countries will generously hand over such military information to cetacean scientists – a little hard to believe though. To provide comments on and obtain information about the Northwest Training and Testing EIS, please attend the public scoping meetings in your area or visit the project website at http://www.nwtteis.com and submit comments by April 27. To learn more about the Navy’s efforts to protect marine mammals and the environment while performing our mission, please visit http://www.greenfleet.dodlive.mil/environment.